Disclaimer: polishes purchased by me! I held strong to them for so long, but I'm finally letting go of my squares (cue dramatic sobbing) Anyway, I've been pretty bummed about my new shape, so I've been leaving them naked for the most part. Today I received my October Polish Pickup order, though, and Supermoon Lacquer's The Hound of Hades brought me out of my slump a little bit. Swatches after the jump break. So, among my multitude of random interests, Greek mythology actually ranks pretty high. As in, when I was 10, I tried to worship the ancient Hellenic gods behind a tree in my schoolyard. Yeah, I was definitely a weird kid. 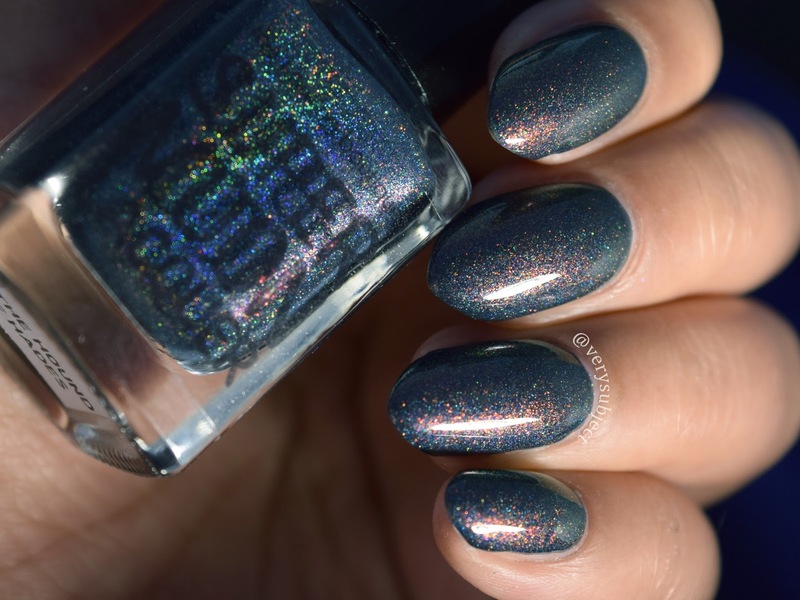 This anecdote is totally relevant, by the way, because this polish is based on Cerberus, the hound who guards the entrance to Hades. As with most things about Greek mythology, we don't actually really have a grasp on what he was supposed to be. Older accounts give him a hundred heads, some made him out to be a snake, and not even a dog or dog-like creature. 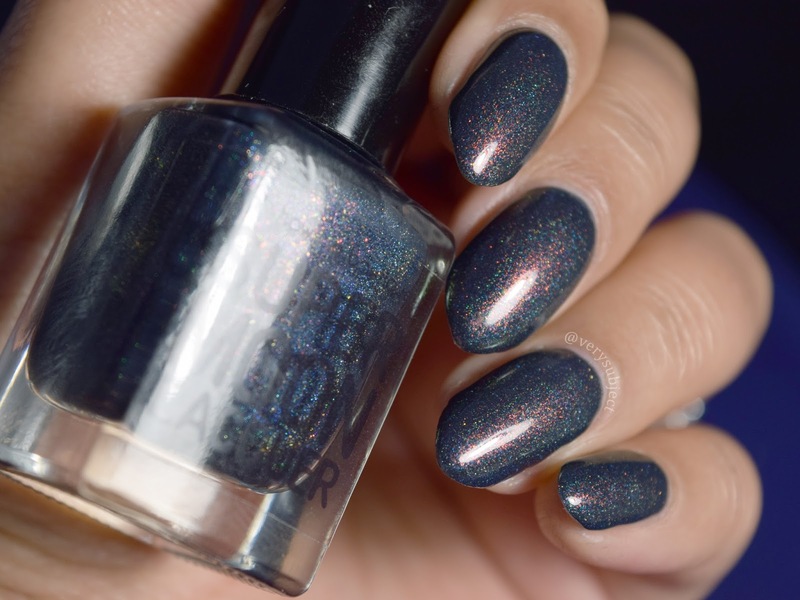 However, these days, when we hear of Cerberus, we usually picture a ferocious three-headed dog, and that's the image the inspiration photo for this polish had in mind. Sorry about that! History lesson over (for now), let's get to the polish! 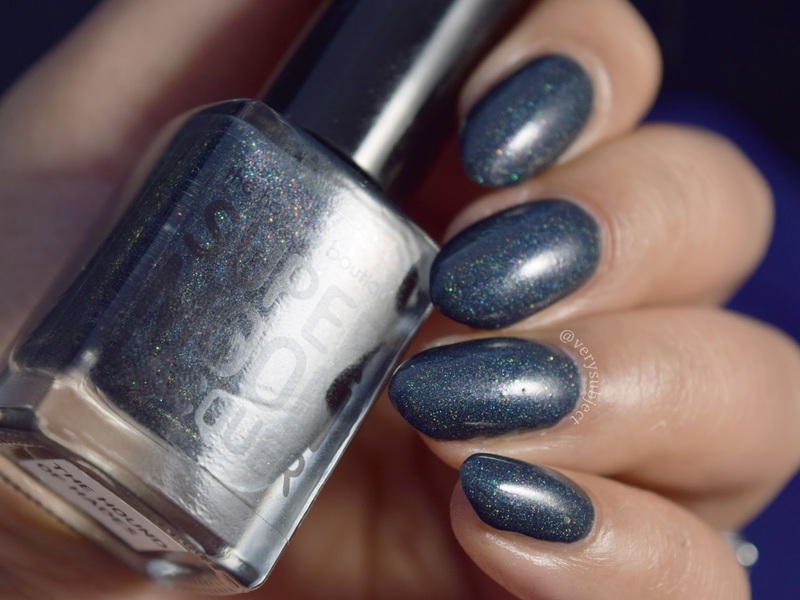 Unfortunately (for you, not me, I already have it), this polish was super limited in addition to the normal Polish Pickup limited: only 63 bottles were made, and they sold out within minutes. I definitely recommend you check out others from this brand, though, because in my experience, they're all amazing with great formulas. 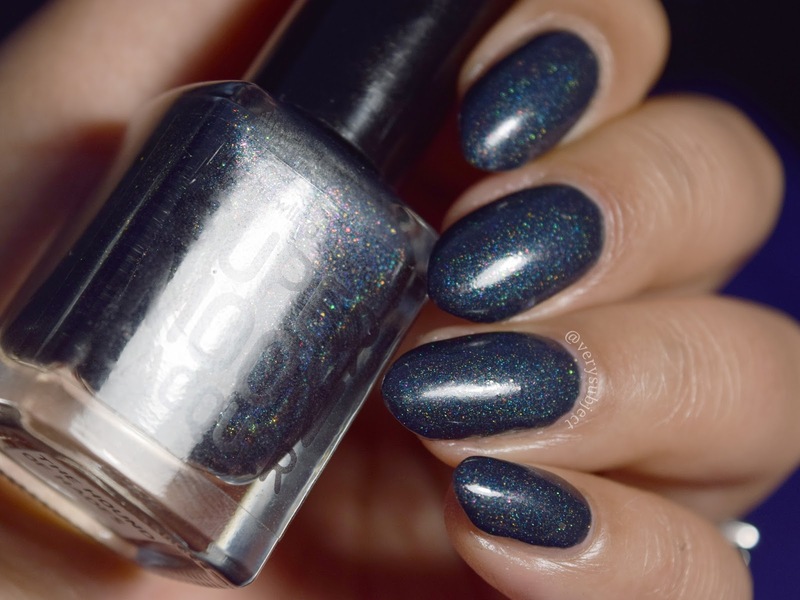 The Hound of Hades is a deep navy holo filled with color-shifting glitter and what the maker described as a UP "dupe" pigment. You guys, this is a true one-coater! Yes, even for me, the girl who always does at least 3 coats when I only need 2. These first pictures are just ONE coat of The Hound of Hades and one coat of top. 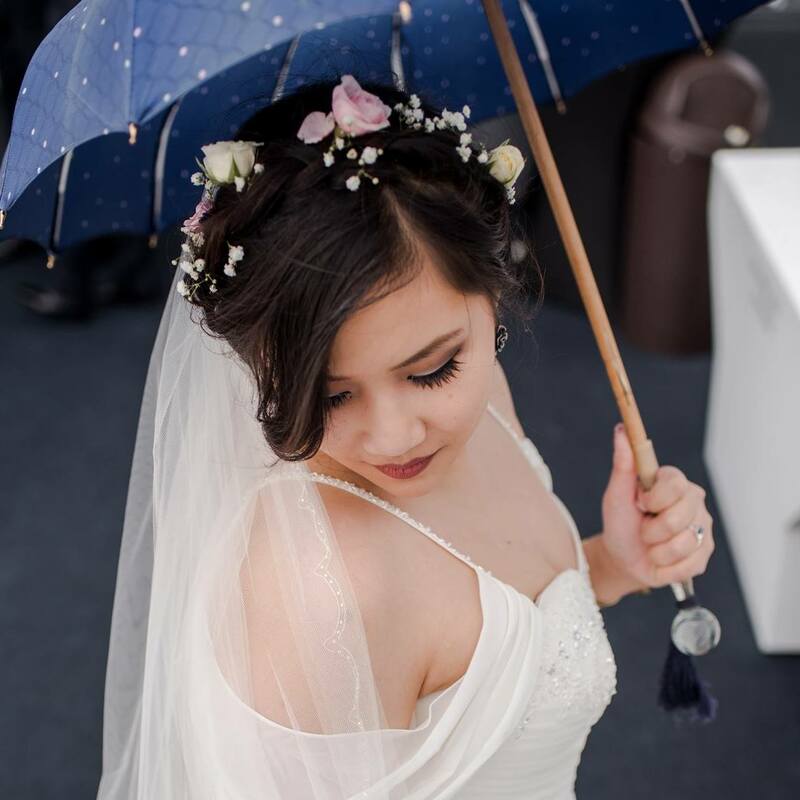 Gorgeous on its own, right? And, like I alluded to, perfect formula. 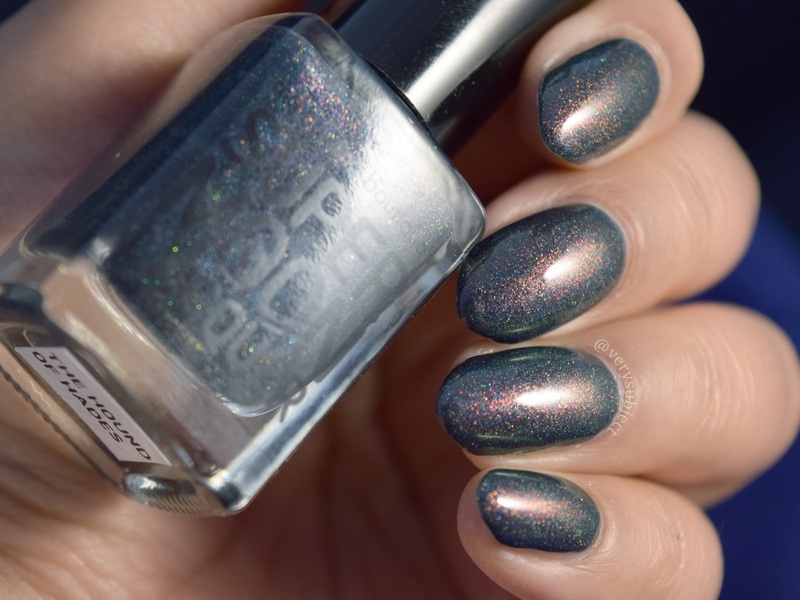 However, if you know me, you know I'm a bit of a shimmer girl, and the shimmer was honestly pretty overshadowed by the other elements in the polish. I just wanted it to have a little touch more of the fires of hell in it. This was when I remembered what I'd read in the description about the shimmer being a UP dupe! I had this moment where I thought, "I have to top this with unicorn pee", so that's what I did. I had a few different options for a unicorn pee topper, but I went with The Magician for a couple different reasons. The first was that I didn't really want to change the base color at all, so I wasn't going to use a tinted topper (although, now that I think about it, I bet it looks amazing topped with Tonic's Uniporn...) and the second was that I didn't want to cover up all of that good stuff in the base, so I had to go with a less dense topper. I feel like I made a really good polish decision with this one. Just look! There you go! 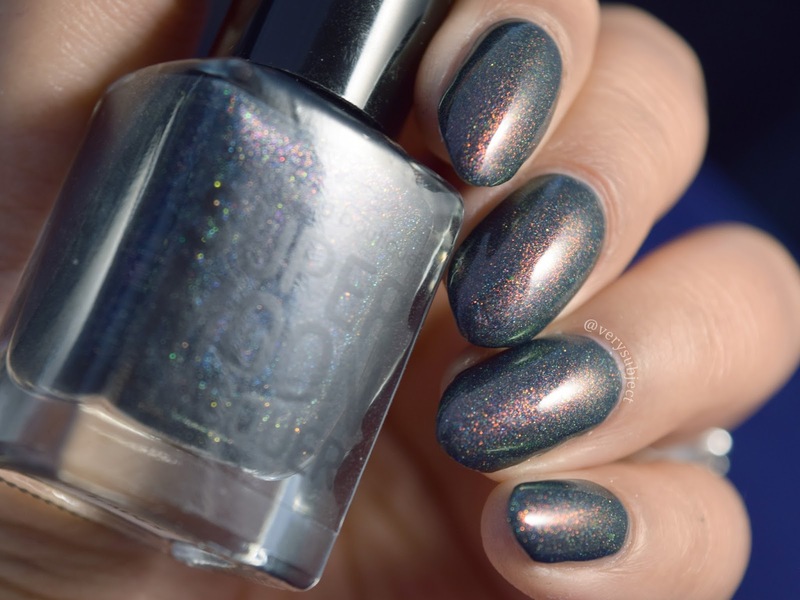 Did you pick up anything from this month's Polish Pickup? Are you planning to grab anything next month? Let me know in the comments below! all the Sailor Moon polishes! Thanks! Haha, they did end up looking a bit like yours! Oct. 2017 Hello Waffle Visage!